What causes eyelid inflammation, and how can you treat it naturally? Although they are delicate and thin, your eyelids serve a couple important functions. First and foremost, they protect your eyeball from dust, debris, and other foreign objects. Second, they help to keep your eyeballs moist and lubricated. When the eyelid becomes inflamed and is not functioning properly, clear vision may be compromised. What is inflammation of the eyelid? Eyelid inflammation has an official medical name: blepharitis. Along the edges of the eyelids there are short hairs: our eyelashes. Each lash emerges from a hair follicle. Within these hair follicles are oil glands. Occasionally, these glands can get clogged or infected as the result of an allergy, irritation, or bacteria. When that happens and the eyelids become inflamed, you have blepharitis. There are actually two different types of eyelid inflammation, anterior eyelid inflammation and posterior eyelid inflammation. With an anterior eye inflammation, the irritation is on the outside near your eyelashes. On the posterior eyelid inflammation, however, the inflammation is inside the eyelid on the part that comes into contact with the eyeball. Of course, the inflammation on different parts of the eyelid are often caused by different things. Unfortunately, sometimes it is impossible to definitively name the cause of the eyelid inflammation, but some risk factors or potential triggers can be identified. If you eliminate one of the possible triggers and the inflammation ceases, it is a good indication that it was the cause of the trouble. You could, however, remove all of the irritants you can think of and still have eyelid inflammation as a result of unknown factors. Dandruff and miniscule skin flakes from your eyebrows or skin surrounding your eyes can irritate the outer portion of the eyelid or the anterior. Keeping the tender, papery skin on your eyelids and the eyebrow regions properly hydrated and moisturized can reduce the amount of dandruff that flakes off your eyebrows or the skin around your eyes. Eyeliner, eye shadow, mascara, powder, and foundation are all applied to the eyelids. Many of these products contain ingredients that can cause allergic reactions and inflammation of the skin. Additionally, many people leave cosmetics on their skin for too long, even overnight, which increases the chances of irritation. 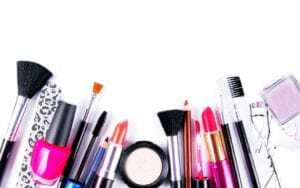 Choosing all-natural or hypo-allergenic cosmetics, thoroughly removing the makeup, and reducing the amount and duration of the makeup can help to relieve the eyelid inflammation. As disgusting as it may be to think about, our human bodies play host to a number of unseen or barely seen organisms. This is not a reflection of a person’s hygiene or cleanliness; it is a fact of life for all humans. Among these tiny parasites are eyelash mites or demodex. Two species of demodex, tiny spider-like insects that are too small to see with the naked eye, live on eyelashes and can cause redness and inflammation. You may also notice patches of missing eyelashes as a result of mites. Despite their small size, our eyelids have numerous glands. In fact, the top eyelid has between 25 and 40 meibomian glands, and the lower eyelid contains between 20 and 30 glands. The miniscule amount of oil that is secreted from these tiny glands is vitally important because it helps to keep the eyelid and eyeball lubricated. From time to time, the opening of one or more of the glands can become blocked, trapping the oils inside the gland and drying the eye. Eyelids are susceptible to various types of bacterial infections, including cellulitis and conjunctivitis. Cellulitis typically occurs after the skin on the eyelid is broken, be it a scratch, bite, or cut. An infection of the inner eyelid and the membrane over the eyeball itself is conjunctivitis. Bacterial and viral infections spread easily from person to person and from touching contaminated areas like doorknobs and railings. Washing your hands frequently and trying to avoid touching your eyes will help prevent bacterial infections. Many commonly prescribed medications, including antidepressants, antihistamines, blood pressure medicine, and acne medication, can cause dryness to the eyelids and eyeballs. That dryness can then make the area vulnerable to infections or allergic reactions. If you are taking a medication that has dry eye as a known side effect, you will have to be particularly vigilant about keeping your eyelids and the skin surrounding your eyes healthy and hydrated. 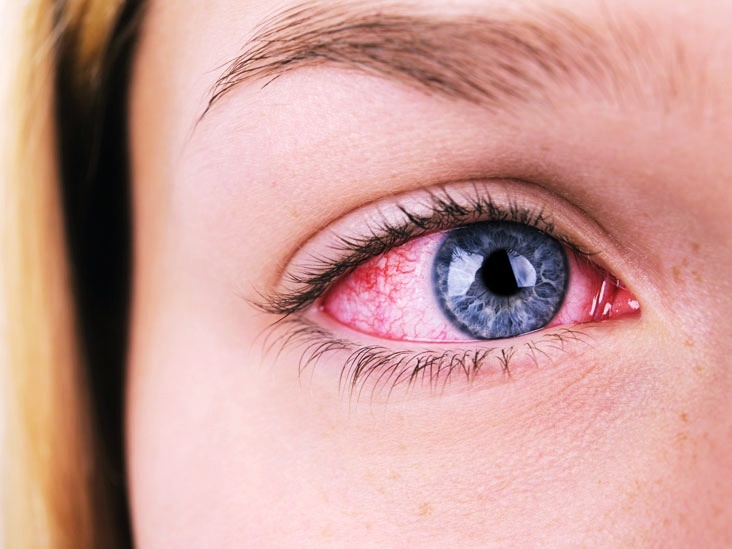 Redness – Red or bloodshot eyeballs or redness of the skin of the eyelid are indications of an inflammatory response. Burning and Itching – Eyelid skin that is itchy and burning is a sign of dryness and irritation that could be caused by an allergic reaction or a bacterial infection. 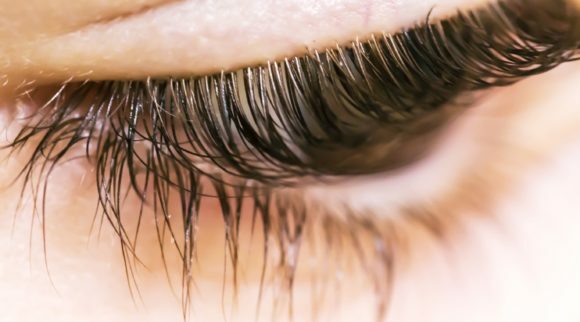 Crusty Eyelashes – Eyelids become easily crusty, particularly around the eyelashes and corners of the eyes, when there is an excess of secretions from the eyes and eyelids. This is often the eye’s natural response to an irritant or allergen. 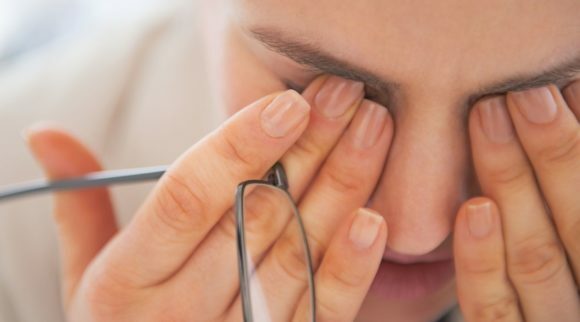 Gritty Eyes – If you constantly feel as though there is something in your eye that is bothering you, it could be that your eyeball is fine; the irritation could be coming from inflammation on the underside of your eyelid. Watery Eye – The way that your eyes flush out irritants is through tears. If there is an irritant in your eye, or your body perceives there to be one, it will trigger your tear ducts to produce more tears in an attempt to wash away the foreign substance. Oily Eyelids – The oil glands on your eyelids are there to lubricate the skin and to keep both the eyelid skin and eyelashes moist and supple. People with naturally oily skin may notice that they have oily eyelids too. Other factors like the use of cortisone, for example, could make eyelids oilier. How is Eyelid Inflammation Diagnosed? Eyelid inflammation can be diagnosed by an eye doctor. Usually, just a cursory look is all that is needed to see that eyelid inflammation is present. What takes longer to determine is the root cause of the inflammation. A close examination of your eyelid, including the underside, should show if a bacterial or viral infection is present by indicating the source of the inflammation. The doctor may also take a swab of the eye secretions for analysis. Most of the time, eyelid inflammation is easily treated and there are no lasting effects. 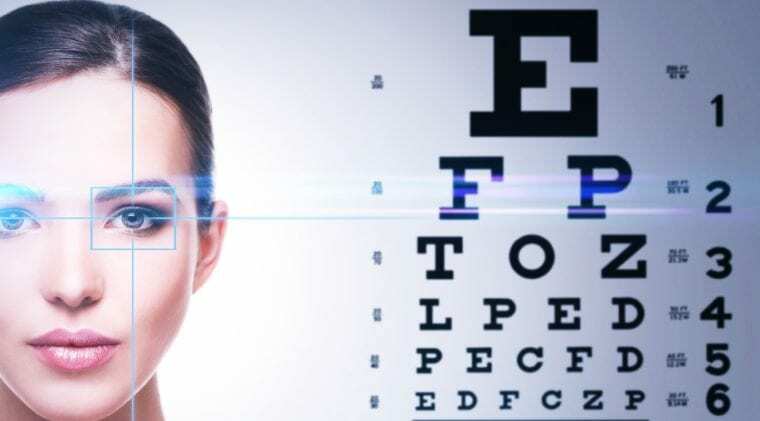 There is, however, the potential for serious complications to arise as the result of eyelid inflammation, especially if the condition is left untreated. An untreated infection, for example, may cause scar tissue to form on the eyelid. If the glands become blocked by the scar tissue or if the infection damages the hair follicles, you may lose your eyelashes. The scarring may also prevent the regrowth of lost eyelashes. Scar tissue that forms on the underside of your eyelid is especially problematic. The scar can rub against your delicate eyeball. This can lead to scratches on the cornea or cause ulcers to form on the cornea. 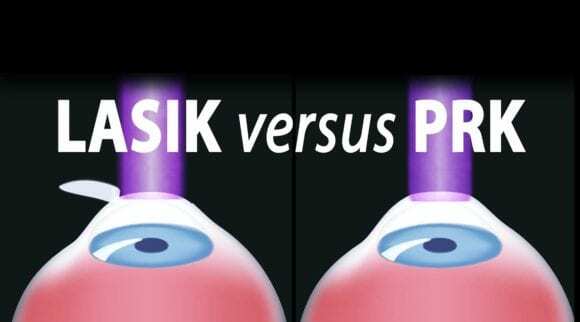 Both of these can result in vision loss and permanent damage to your eyeball. How is Eyelid Inflammation Treated? The treatment for the inflammation will depend upon the diagnosis and the severity of the eyelid inflammation. In many cases, you can treat the eyelid inflammation yourself using home remedies or over-the-counter treatments. In severe cases, particularly when infection is present, your doctor may prescribe an antibacterial medication. He or she may even prescribe you a steroid to reduce the swelling. Antibiotic Treatment – If a bacterial infection is diagnosed and if the doctor fears that the infection may become worse or spread, the doctor will typically prescribe an antibiotic. The antibiotic may come in the form of liquid eye drops, eye ointments, or oral pills. In recent years, antibiotics have gotten a bad rap due to overuse and doctors who over-prescribe them, but when used as they were intended to be used, antibiotics are the best way to kill off a bacterial infection. If your eyelid swelling is not the result of a bacterial infection, your doctor may prescribe a steroid to treat the inflammation. Steroids are effective at alleviating swelling and inflammation. You may be given the steroid in the form of a steroid eye ointment or steroid eye drops. At-home remedies for treating inflammation of the eyelid include eye washes and warm compresses. Keeping the skin of the eyelids and around the eyes clean and moisturized also helps. In addition to doctor-prescribed treatments, there are several over-the-counter options for treating eyelid inflammation. 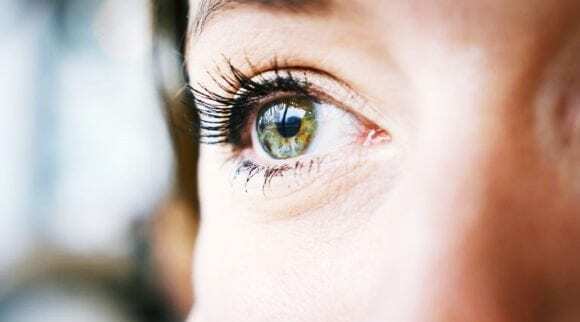 The following is a guide to some of these eyelid inflammation treatments that are ideal for people who are concerned about using harsh chemicals or medications. Using all-natural ingredients and a holistic approach, these products can be just as effective at reducing eyelid inflammation when used as directed. Visual Advantages Premium Eyelid Wipes use the power of essential oils to provide relief for itchy, swollen eyelids. Aloe and coconut oil are other ingredient of these wipes, both of which aid in providing moisture and hydration to tender skin of the eyelids. The easy-to-use wipes are soothing and convenient. They help to clean the eyelids and remove dirt, dust, and debris, all while lubricating the delicate skin of your eyelids. Each eyelid wipe is individually wrapped, so it stays sterile until you are ready to use it. The individual wrapping also make them super convenient to carry with you to work, to school, or on your travels. These doctor-recommended eye cleansing wipes are an important part of your daily eye care routine because they clean and moisturize at the same time. Additional Information: Washable and reusable, antibacterial and non-allergenic. 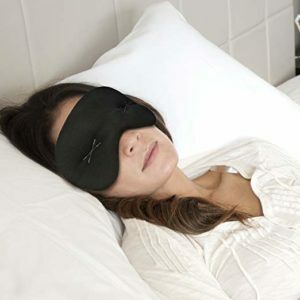 This innovative mask is microwavable, so your tired, dry eyes are soothed and relieved by the warm, moist heat. The eye compress mask is washable and reusable. You won’t have to worry about the eye compress harboring hazardous bacteria; it is made of hypoallergenic and antibacterial material and is easily washed clean. 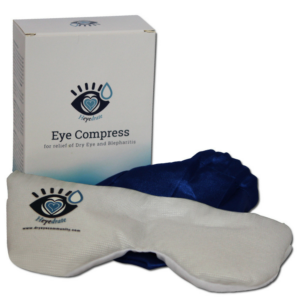 The Moist Heat Eye Compress is a way to improve gland function, tear production, sooth inflammation, and hydrate the skin around the eyes in a totally drug-free way. 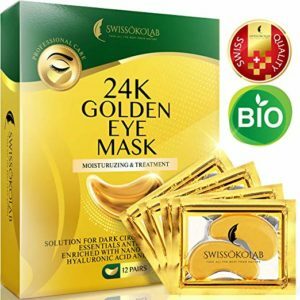 Swissokalab’s24k Gold Eye Patches are a safe, proven way to revitalize tired eyes and protect damaged skin around the eyes. In fact, you will see a noticeable difference after just a few uses. The luxurious eye patches give you the feel of an expensive spa treatment but for a lot less money. The hydrating power of the 24k Gold Eye Patches is effective for reducing swelling and puffiness, smoothing wrinkles and fine lines, and eliminating dark under-eye circles. The hyaluronic acid and collagen in the product are effective at keeping the skin around the eye firm and elastic. Cold therapy is always recommended for reducing swelling and inflammation, and the IMAK Compression Pain Relief Mask and Eye Pillow is an ideal way to employ the soothing relief of coldness. The washable, reusable mask is filled with ergo microbeads. When stored in the freezer, the mask retains the cold temperature and provides cooling relief. The beads are weighted, so the cold mask stays snug to your eyes, but the cross-stitched eye pillows ensure that the eyeballs are protected from compression. 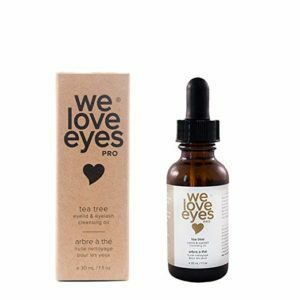 The key ingredients in We Love Eyes All-Natural Tea Tree Eyelid Cleansing Oil have been especially blended to provide soothing relief to swollen, dry eyes. Tea tree oil is effective in reducing bacteria and demodex eyelash mites. Organic jojoba oil is useful in keeping the tiny pores of the eyelid area clean, clear, and open. Lastly, the grapeseed oil is a good anti-inflammatory that takes down swelling on the eyelids. 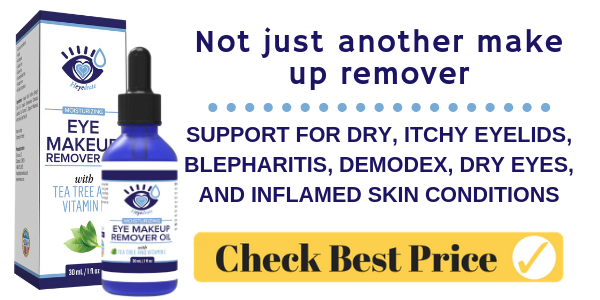 Developed by an eye doctor to address the problem of chronic dryness and redness in her patients, the all-natural product doesn’t contain any of the harsh, drying ingredients that are often found in traditional eyelid cleaning products. 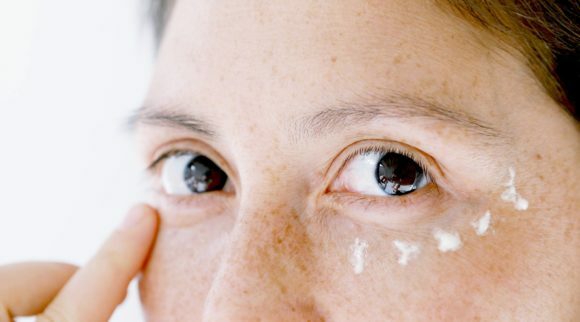 She wanted a product that was also free of retinoid because studies have shown that retinoids can damage the tiny, delicate glands on the eyelid. 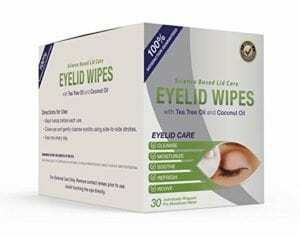 Recommended by eye doctors to help relieve the symptoms of blepharitis, conjunctivitis, and dry eye, Dr. Fisher Premium Eyelid Wipes are gentle enough for the fragile skin of your eyelid but thorough enough to clean away dirt, dust, oils, sweat, allergens, and debris from around your eyes. 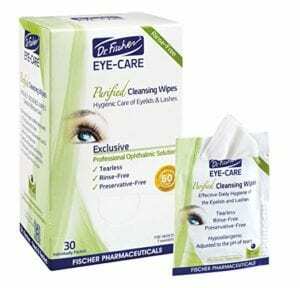 Cleansing the eye area with Dr. Fischer Premium Eyelid Wipes is also effective at preventing infection and reducing recovery time from infections such as conjunctivitis and blepharitis. These wipes are gentle enough to use daily as a makeup remover and will safely and thoroughly remove debris from your eyelids without causing dryness or irritation. 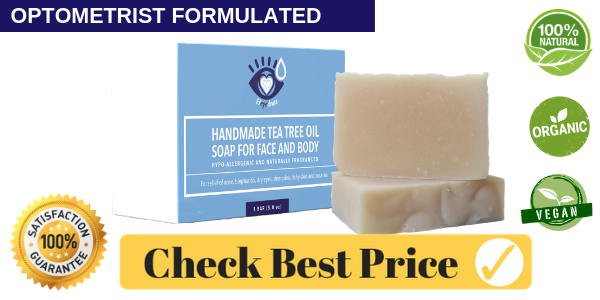 Made with all organic ingredients, including beeswax, olive oil, and honey, Bee Friendly Face and Eye Cream Moisturizer provides deep hydration and moisturizing of your face and eye area, leaving skin that is smooth, elastic, and flake-free. 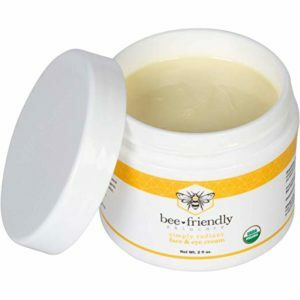 Since flaky skin particles are one of the leading causes of eyelid irritation and inflammation, Bee Friendly Face and Eye Cream is effective at preventing eyelid inflammation and irritation by keeping the skin of the eyelid and the region surrounding the eye healthy and hydrated. The product is USDA-certified organic and does not contain any fillers, chemicals, parabens, or fragrances. It is an all-natural way to moisturize skin, smooth out wrinkles, and prevent dryness. 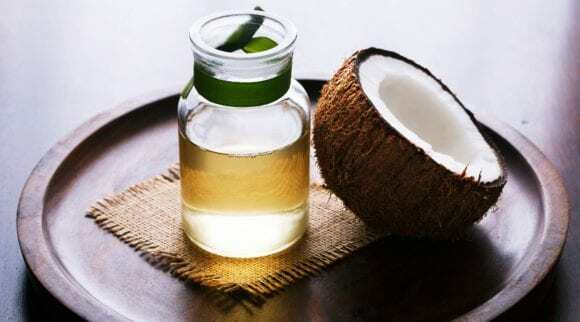 The raw honey in the ingredients contains antibiotic properties and stimulates the production of collagen in your skin. Beeswax won’t clog pores like chemical-based products. The olive oil adds vitamin A and E to your skin.